Should David Attenborough retire from making TV documentaries? I love David Attenborough - I think he is probably my favourite documentary maker, and I would have loved to have a job like his. But he has dominated the documentary field for so long that maybe it's time for him to retire and allow others to develop a following. What do you think? Noooooo! I love David Attenborough. As long as he is able to do what he loves I say go for it. The viewing audience is big enough for other wildlife documentary presenters to make their mark. Even when Attenborough just provides the narration his enthusiasm comes through. LOL, yes I think I feel the same! I can't imagine nature docos without him. I don't see why he should retire from something he loves and is so good at just to let other people have a go. He might be the main wildlife documenter, but there are plenty of others, and he is not stopping them from making a documentary of their own. In an interview a while ago, Attenborough said that he had no intention of retiring, and that's he'd go on until he could go on no more. I say good on him, and here's to many more Attenborough documentaries. He's the best there is. Nooooo! He's not stopping others, anyway. They can still make them. I don't think anyone can deny that David Attenborough has paid his dues a hundred times over. In my mind, he can keep doing what he loves for as long as he wants. Not only is he amazingly good at it, but he's earned the right to it. 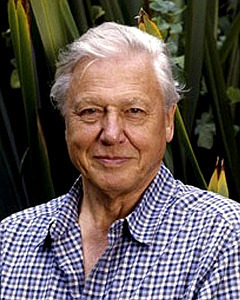 David Attenborough is knowledgeable, caring, a tried and tested conservationist, and a skilled teacher. There are very few like him. He should continue to make documentaries because one can rely on the authenticity and honesty of his productions. Definitely not. He is a legend. No way. I think he's great. He's knowledgable, up for just about anything & makes things really interesting. Whenever I see his TV shows, I always think what an interesting & rewarding life he must have had, and he's still experiencing new things. David should follow his heart , work until he cannot, l love to see his docs, others can still do their own docs, so there is a comparison about who is better. Everyone taste is different, David doesn't need to retire unless he chooses not to. If it isn't broken....why change it. He has earned his time, and many people would more than likely stop watching. Lets face it, there is only One David A.
I think the same, or at least, the BBC should invite someone else to do these big projects. As good as he is, it really is dead mans shoes because the amount of money it takes to make a Planet Earth means there can be only one. There are plenty of people who could do it just as well or better and a change of voice would be refreshing. Would you do something illegal to support your family if you knew you were going to die soon?